Each day that passes brings another disturbing incident of hate violence against our communities. In response, each day we are more united, organized, and determined in our pursuit of justice for South Asian Americans and all. On December 19, SAALT hosted a webinar on hate crimes with groups working on the front lines of this struggle. Members of the National Coalition of South Asian Organizations, the largest South Asian American network of community-based advocacy organizations, shared their insights on this urgent call, along with the San Francisco chapter of the Council of American-Islamic Relations, the nation’s largest Muslim civil liberties and advocacy organization. The Alliance of South Asians Taking Action, a Bay Area all-volunteer group, also joined to describe how they’re aggressively documenting local hate incidents for use as public evidence. Representatives from the Federal Bureau of Investigation and Department of Justice also participated in this webinar, providing a variety of insights into America’s hate violence problem, as well as an opportunity to brainstorm solutions for the future. This online event couldn’t have come sooner. The FBI’s most recent Hate Crimes report revealed not only a 7% increase in hate crimes overall, but also an alarming 67% increase in hate crimes targeting Muslims. SAALT’s own database confirms an uptick in hate violence and xenophobic political rhetoric against our communities nationwide in 2016, with incidents expected to accelerate in the new year. SAALT will continue to push back against hate, but we need your help. Big battles require big support. Please stand with SAALT as we take on the challenges ahead. By donating today, SAALT can continue tracking hate, supporting our partners nationwide, and demanding justice and cooperation from our government. With you by our side, we can make America better, together. We can only do this with your support. Stand with us today. A day earlier in New York City, Soha Salama, a Metropolitan Transportation Authority (MTA) employee was harassed, called a “terrorist”, and pushed down a flight of stairs at Grand Central subway station. She was told to “go back” to her country by her assailant during the attack. Days earlier in Pittsburgh, Ankur Mehta was working on his computer in a Red Robin Restaurant when a drunken man told him “things are different now” and “I don’t want you sitting next to me.” He then proceeded to use racial slurs such as “sandn****r” before striking Mr. Mehta several times with his fists and elbows. These incidents occurred in a span of a little over one week. Sadly, there are many more. 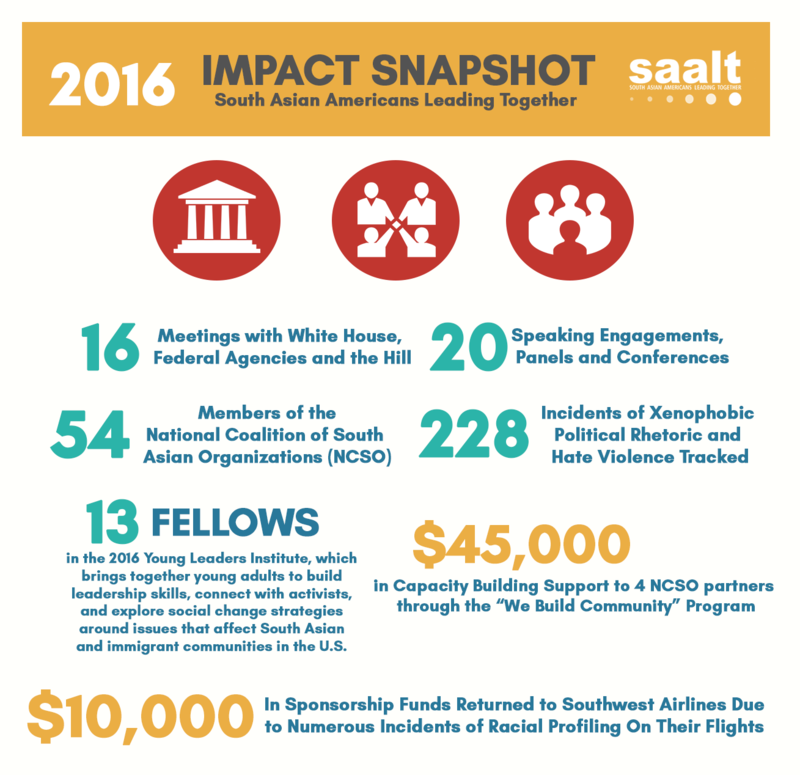 In 2016 SAALT tracked over 200 incidents of hate violence and xenophobic political rhetoric against our communities. These incidents have surged massively in the wake of the Presidential election. We need your support now more than ever to push back against hate. Hold the 10th anniversary of our National South Asian Summit where hundreds of thought leaders, organizations, and activists from across the country will come together to strategize on how to support and defend our communities in this new and uncertain future. We will then take to Capitol Hill to engage with policymakers and government agencies en masse. The time to answer the urgent call for South Asian American justice is now. Please stand with us as we take on the enormous challenges ahead. Will you make a contribution to our work? With your support, we can push back against hate so that our communities can enjoy the freedoms and rights owed to all Americans. With your contribution, we can help make America better for us all. Please donate as generously as you can today. 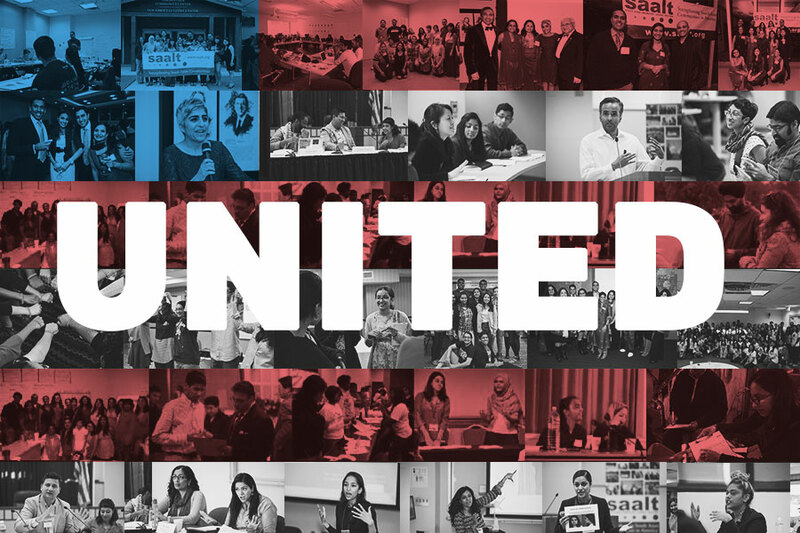 In a year defined by hate, where our communities have suffered historic levels of violence and xenophobic political rhetoric nationwide, SAALT worked even harder to ensure our communities’ voices were heard louder and farther than ever before. With your help, we’ve made significant strides. In 2016, we tracked over 220 incidents of hate violence and xenophobic rhetoric against our communities. In the coming weeks we will release a report to policymakers, law enforcement, and the new administration to make sure they fully understand the extent to which our communities are under attack. We will demand that the government use its full power to ensure our communities are protected, not targeted or ignored. In 2016 we terminated a 7-year relationship with Southwest Airlines due to repeated incidents of racial profiling against our communities on their flights. Doing so meant returning $10,000 in sponsorship that supported many of our vital programs. 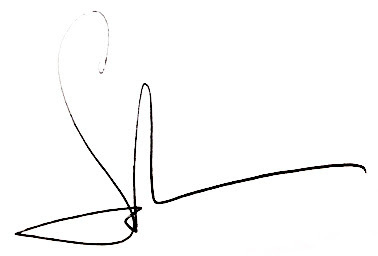 At SAALT, we advance ideals of justice and equality, and live by them fiercely and faithfully. One such program is the Young Leaders Institute (YLI), which brings together 13 young adults to learn leadership skills, connect with activists, and develop practical tools and action plans to protect immigrant rights on and off campus. For 4 years SAALT has trained 72 young adults to take on the challenges of the future, and with your support we can continue training tomorrow’s leaders today. 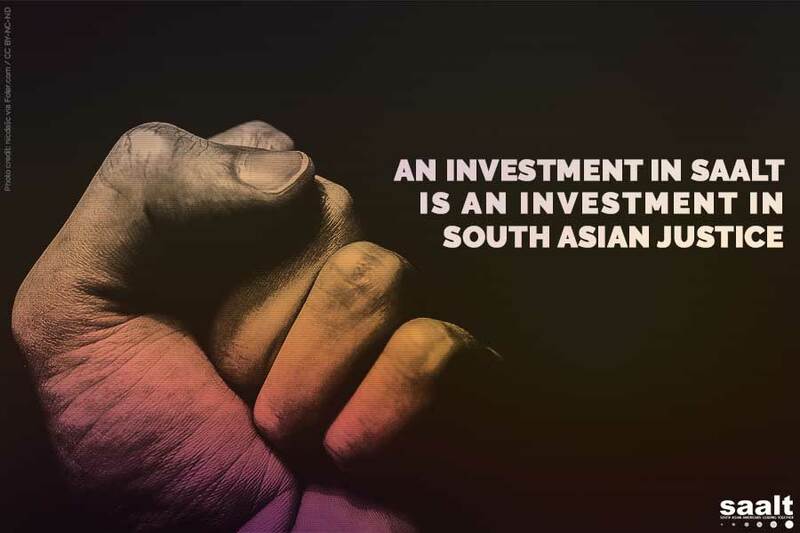 Through our We Build Community program, we provided $45,000 to four grassroots South Asian American groups to support and increase their capacity to fight for racial justice and immigrant rights across the country. We continue to coordinate and expand the National Coalition of South Asian Organizations (NCSO), a group of 54 community partners that foster a broader movement for racial, gender, and immigrant justice. The NCSO is the largest network of South Asian American organizations in the country, and is a crucial voice as we confront the ongoing challenges facing our communities. These examples reflect our increasing commitment to South Asian American justice. We need your support so we can continue defending and demanding rights for our communities nationwide. Please donate today to sustain and expand our work on this long road ahead. While the future may be uncertain, what you can be sure of is SAALT’s commitment to our communities, our partners, and our mission. 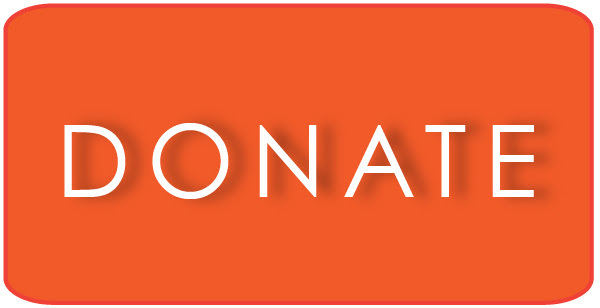 Please stand with us today and donate as generously as you can.